Rt. Rev Datuk Cornelius Piong D.D. Bishop Cornelius Piong was born on July 1, 1949 in Bundu Kuala Penyu, North Borneo (now Sabah.) He was ordained a priest on march 27, 1977 and was appointed bishop of Keningau on February 2, 1993. his episcopal ordination was on May 6, 1993. He is currently the president of the Malaysia-Singapore-Brunei Episcopal Commission for Culture and the Malaysian Catechetical Commission. 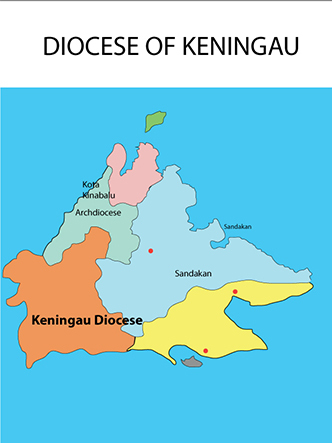 Bishop Cornelius is the first bumiputera (indigenous – Kadazan Tatana) bishop in Malaysia and the first local bishop of the diocese of Keningau. Hail from Kuala Penyu, he entered St. Francis Xavier minor seminary in Singapore in 1970 and College General major seminary in Penang in 1972. He was ordained priest on the 27th March 1977 at St. Peter Bundu Kuala Penyu parish by the late Bishop Simon Fung. He was appointed as Vicar General of the Diocese of Kota Kinabalu in June 1987. He received his appointment as the Bishop of the new Diocese of Keningau on the 17th December 1992, and was ordained Bishop on the May 6, 1993 at St. Francis Xavier Cathedral Keningau by Archbishop Datuk Peter Chung of Archdiocese of Kuching.